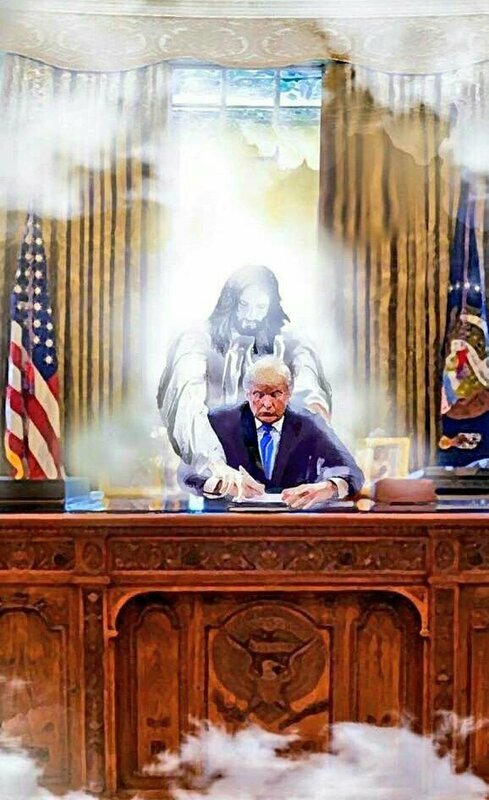 Of course we must always remind ourselves and others that President Trump is not our Savior. Jesus Christ is. Ahead of the election, neo-Pentecostal prophets received messages from God comparing Donald Trump to Cyrus (a non-believing ruler who restored the Jews to Jerusalem and Judea) and to King David (whose heroism was flawed due to sexual indiscretions) – useful rationales for voting for a man whose character and appetites were otherwise completely incompatible with Christian Right values. It has also been claimed that prophets were told years ago that Trump would one day be president: in 2007, God told “singing prophet” Kim Clement that “I will raise up the Trump to become a trumpet, and Bill Gates to open up the gate”, which, although obscure at the time, is now taken to be a reference to the election. Then, in 2011, God made himself clearer to a retired Florida fire-fighter named Mark Taylor, while Taylor was watching Trump on TV. During the campaign itself, God told Denise Goulet, wife of Pastor Paul Goulet, that Trump was his “son, with whom I am well pleased”, while a Messianic Rabbi used numerology to prove that God had arranged for Trump to become president at just this moment. On the day of the inauguration, God further made his views known by a bit of rain, supposedly a “blessing”. Since then, God has continued to communicate with various prophets about Trump and the meaning of his presidency. Shultz’s Elijah List is a sort of clearing house for these messages and visions, and some items are further disseminated via Charisma News, which is part of Stephen Strang’s evangelical/neo-Pentecostal media empire. Charisma‘s correspondent here is Bob Eschliman, who ahead of the election also produced secular anti-Clinton articles for the website. Eschliman tends to quote the prophecies at length, one suspects because they are very difficult to encapsulate coherently. Lana Vawser warns of demonic snakes “with a specific assignment to do whatever it took to hinder what God is birthing in the United States of America and through President Donald Trump”.